We were on the bed, laying in our usual position, heads further away but legs tangled into each others. It was something that bothered him at first - my inability to sleep with my head dug into his arms. It is so theatrical, one can't really breathe comfortably that close, I can't breathe I would exclaim. He understood not just the need for physical space, but the space I needed to learn and grow, to fail and concur, to find my individuality as a tender and seemingly unsure twenty year old. My man, has been the cornerstone of my life, accepting my weaknesses and spiking his endearing mellow grin on my successes. He has taught me to seek happiness in the littlest things - a good bargain at the store, a juicy sweet crate of peaches, an unexpected warm mug of tea, a call from an old friend. His continued and selfless friendship has made me independent of falling in the trap of failed, pretentious friendships that just pull you down in long run. When the day has been tough, he's made me egg for dinner. As we crawled under covers, on our anniversary last week, kissing a final goodnight to our little sunshine, I dug my head into his chest, took deep breath to stay as long as I could. It has been marvellous seven years together, indeed. Thandai is Indian cold drink that is made with milk. What makes this beverage special is the spice and nut mix which is added to the cold milk. I took this spice mix and added it to some ricotta in this galette. 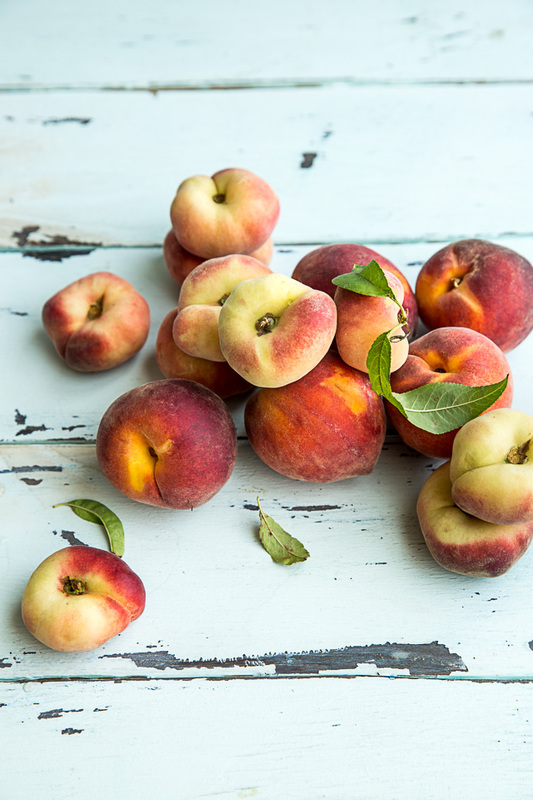 The fennel, cardamom and black pepper extenuate the sweet, fruity accents of the peach. Usually, I would add saffron and rose petals to my thandai spice mix, but here I have omitted it to let the flavours of peach be dominate. Ricotta sets and forms a thin cheesecake like layer, which I think can easily be doubled here, but mascarpone would work as well. The other day, I served the galette (just a rustic tart really) with some salted caramel (which come to think of it, I always end up doing) and while we loved it, I think it overpowered the thandai flavour a bit. Either way, we loved it. Before you start with the recipe, keep your flour and cut butter in the freezer for 15-20 minutes. Pulse the flour, sugar, baking powder and salt in a food processor. Add the butter and keep pulsing till you get pea size crumbs. It doesn't have to be consistent pea size all around. Sprinkle in the cold water and pulse just until the dough is moistened. You don't want to pulse too much at this point. Turn the crumbs onto a work surface, and bring it together into a disk. Wrap the pastry in plastic and chill for 30 minutes. On a work surface spread out parchment paper and flour it well. Roll out the pastry on it to an 11 inch round, about 1/4 inch thick. Transfer the pastry along with the parchment paper to a baking tray. Chill for 15 minutes. Meanwhile, grind all the ingredients under spice mix. Stir the thandai spice mix and sugar with ricotta and keep aside. You might want to add some more sugar based on preference. 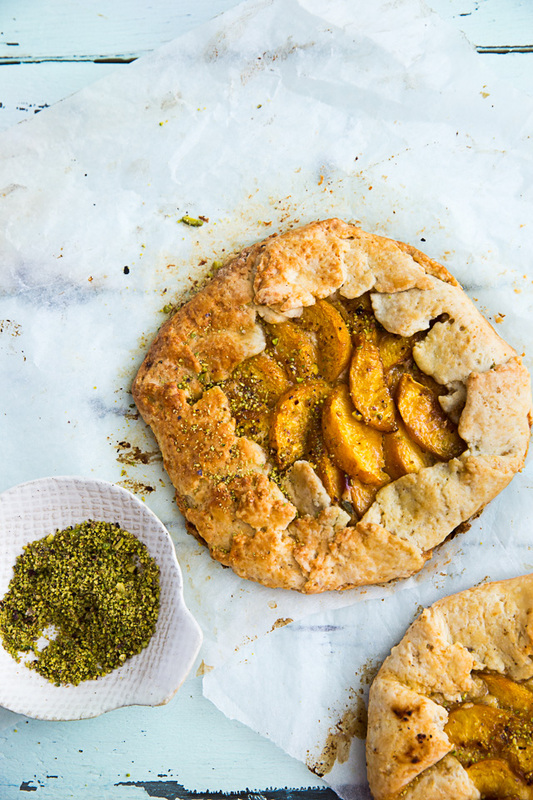 Spread out the ricotta on the pastry and arrange the peaches slightly over lappingly. Fold up the pastry over the peaches, leaving most of the peaches uncovered. 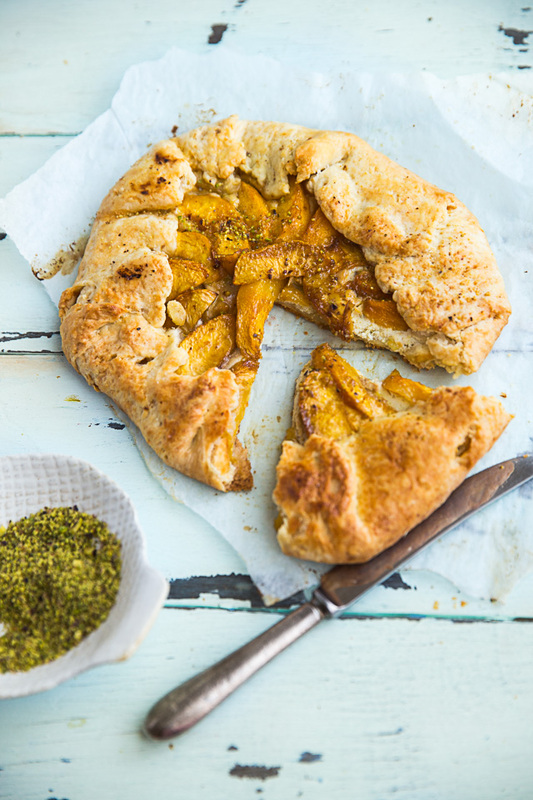 Brush the pastry with the egg wash. Sprinkle the tart lightly with 1 tablespoon of the brown sugar and pistachio dust. Freeze the tart until solid for at least 4 hours or preferably overnight. Preheat the oven to 190°C (375°F). Bake the tart directly from the freezer for an 1 hour (my oven has been acting all weird lately!) or until the pastry is deeply browned. Let it cool on a cooling rack. Serve with a sprinkle of pistachio dust or salted caramel. This is lovely! And the photographs are gorgeous. Happy Anniversary! Your husband seems to be a perfect match. A wonderful galette and lovely pictures. Happy Anniversary! Touching post. Sure your husband should be so caring and its mutual too I guess. Perfect pastry to celebrate. this line - "His continued and selfless friendship has made me independent of falling in the trap of failed, pretentious friendships that just pull you down in long run." YES. Happy Anniversary. A beautifully written post with equally beautiful photos. Ah ha that part of the post got erased! Thank you so much for pointing it out. Just updated the recipe. This is so beautifully written. I'm getting married in two weeks - I only hope I feel as in love with my dude as I do now. Happy Anniversary! Also, this galette is lovely. Divine! Sweetly tender and divine. Thank you. great flavor profile, I will certainly try it. I cannot understand why people bother with the food processor when making pastry dough. the noise, the cleanup, the lack of control. just use a bowl and your fingers, or a pastry blender( a hand tool) a knife is said to work or fork. it's easy and you know when the butter (fat) has the right consistency with the flour by feel and look. when adding the liquid a bit a t a time you do not have to deal with the lid of the food processor...off and on did it get on right...noise, noise, noise off and on again. just put your hands in a bowl and make your food! Perhaps you don't have very warm hands like I do :) A fork and a knife? Yeah that would work but would take forever for someone like me. Happy anniversary Kulsum. I wish you many more happy years together. I absolutely love the recipe. 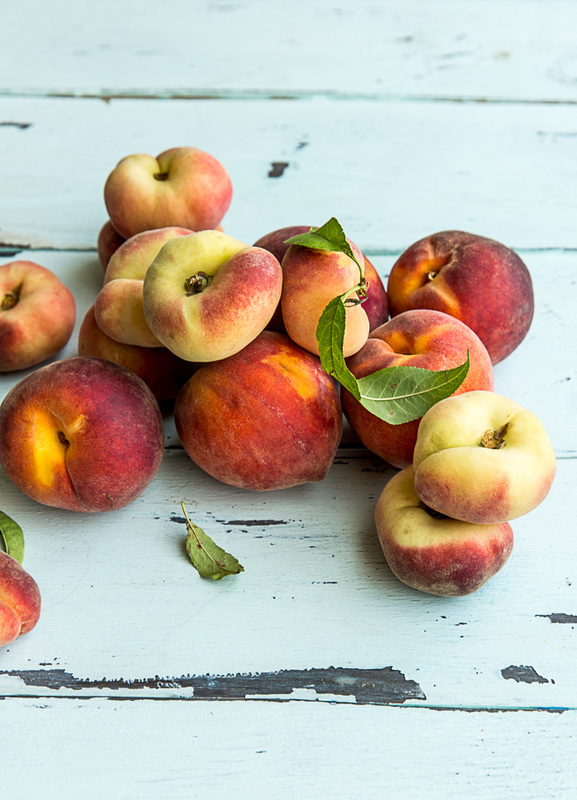 Now that the peaches are in season, I have to make it soon. I just have to make a trip to the farmer's stand. can't wait. I forgot to ask you, do I need to freeze the tart or keep it in the freezer for four hours? Or, can I do it right away? Thanks! Kulsum, I made it twice already. I did not freeze it because I didn't get your reply. I just kept it in the fridge for few hours. I'll make it again with some other fruit and freeze it next time. I posted it on my blog and the post was inspired by your post. :) Thanks for getting back to me. Great mixture of ingredient. This sound scrumptious. Mouthwatering recipe. Thanks for sharing this wonderful post. Love love love this! Stunning pics, heartfelt words and a clever Indian twist on this classic pastry. Happy anniversary! I need to chime in with everyone else to tell you that your blog is WONDERFUL! I was hooked from the first recipe I came across (on Pinterest). Your storytelling, recounting your past, your childhood, culture, memories...it's fascinating, beautiful and warms my heart.